The ideal method and implant to perform total hip arthroplasty (THA) is still a debated topic. Ceramic on ceramic (CoC) bearings have favourable wear properties, but squeaking has been reported as an unwanted side effect. We aimed to determine the rate of noise generation from CoC hips and investigate whether there is a relationship with patient satisfaction. A total of 246 consecutive CoC bearing uncemented THA were retrospectively identified in a single institution. 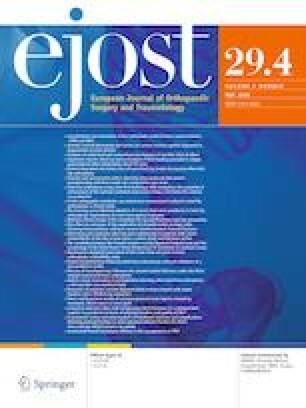 Post-operatively patients were sent a postal questionnaire to evaluate their reported sounds and satisfaction with their THA. Uni- and multi-variate analyses were performed to identify potential predictor variables for reported post-operative sounds. Questionnaires were returned by 172 patients (70% return rate). 24% reported sounds from their hips with 11% reporting a squeak. Median satisfaction levels were minimally, but significantly less for “noisy” (9/10) than “quiet” hips (10/10) (median difference = − 1, 95% CI − 2 to 0, p < 0.001). Compared to those with “noisy” hips, patients with “quiet” hips were 1.7 times (95% CI 1.3–2.5, p = 0.0002) more likely to report a “forgotten” hip. Younger age (p < 0.043) and increased anteversion (p < 0.021) were predictors for reported sounds. We have identified a high rate of “noisy” hips in this series of CoC THA with a significant inverse relationship between “noisy” hips and patient satisfaction levels. In our unit, we are moving towards the use of ceramic on cross-linked polyethylene bearings as a result of these findings and the excellent survivorship of this bearing combination. Barrow has nothing to disclose. Divecha has nothing to disclose. Panchani has nothing to disclose. Boden has nothing to disclose. Chitre has nothing to disclose. Gambhir reports an Educational contract with Johnson and Johnson. Porter reports he is Medical Director of the National Joint Registry of England and Wales (NJR), Chairman of the NJR Editorial Board and Past President of the International Society of Arthroplasty Registers (ISAR). Board reports grants and personal fees from DePuy Synthes, personal fees from Springer, outside the submitted work; he is Associate Editor of Hip International and a Research Committee Member for British Orthopaedic Association.